I wrote Dyox to enter into a PSP Homebrew contest hosted by QJ.net. One of the rules of the contest was that the game must be new, and not a newer version of a previously made game. For that reason, I decided not to revamp A Boy and His Dog and instead work on a new project. The contest was announced mid-June, and the deadline was the end of August. Since I was leaving for college in mid-August, I had only 2 months to complete the game. After a few days of thinking and refining, I had a pretty good idea of the game I wanted to make. A long time ago, back in the Windows 3.1 days, I played a game called Oxyd (now reborn as Enigma) and enjoyed it very much. In Oxyd, you took the roll of a small, black ball who had to save the world by opening Oxyds. Oxyds would open when you hit them and reveal a color. It was your duty to open the same color Oxyds, since you may only have one Oxyd open at a time. There was, however, one major thing I wanted to change about Oxyd to make my own game. The main challenge in Oxyd was not the puzzles, but rather your own dexterity. 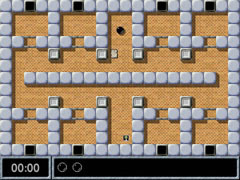 Many of the puzzles in Oxyd require you to take the same difficult path several times to activate the Oxyds. This gets repetitive quickly, and is honestly kind of boring. I wanted to remove this repetition, so instead of having the player activate several Oxyds to complete the level, I just put in a Finish square. That way they only have to traverse the obstacles once. So I set to work. Like ABAHD, Dyox was programmed in C using GCC as a cross-compiler. I used a similar tile system to that of ABAHD, but instead of putting them in a huge linked list, I placed them into a grid. As you can read in the ABAHD Development Page, this makes the program a lot more efficient. Nothing very exciting or noteworth happened during development. It went fairly smoothly. The finished game features movable blocks, pits (which can be filled with movable blocks), switches, lasers, mirrors to deflect lasers, cutscenes, burnable plants, and more. I'm really satisfied with the feature set in the game. I think it contains all of the core elements that made Oxyd fun, while also adding a few of my own. At 15 levels long, it's a fairly difficult game to complete. In case it's too difficult to complete in one sitting, I added a password system so that you can continue your game later. While I feel the game has all of the most important features that I wanted to add, there are a few that didn't make it into the 2-month time limit. The first feature I would've liked is to let levels have multiple screens. This really adds a whole new dimension to the game, as hitting a switch on one screen might effect something completely unseen on another screen. I also would've liked to have added a timer of some sort and a high score list. This would've added some replay value that I felt was missing. The final thing I wasn't able to do was add more levels. The game feels short, and just as you're getting into the flow of things, it ends. I wanted to add another 5-10 levels, but I didn't have enough time. 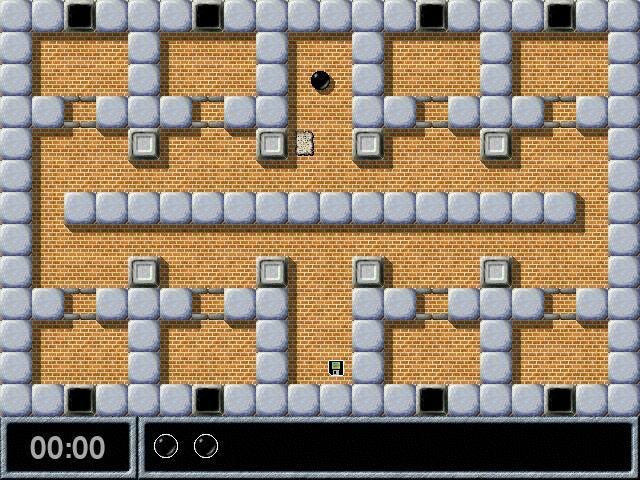 In addition, I was running out of ideas for puzzles, so I'd probably have to add new features as I go to keep the levels from getting repetitive. The black bar down the left side of the screen was going to hold items and status information such as lives or a timer. As I mentioned above, however, I didn't have time to add those things. I had already finished a good amount of levels by the time I realised the black bar is useless, so it was too late to remove. So there it is! Somewhere around the middle of development, I found out about another contest being held at the same time, with similar due dates to the QJ.net contest. This contest was hosted by Korean homebrew utilities developer NeoFlash. The prizes up for grabs were magnificent! They were even offering a Nintendo Wii to the winner in each of the four divisions! I decided to enter my game into both contests and hope I wasn't violating their rules. Verdict: A Minus. Although he cites that the main menu is one of the game's unfinished bit, an improvement is always welcome. Also, just to make the escape more thrilling, we suggest adding some sound effects and a theme in the game's future release. I don't know what that means, but it didn't make it to the contest. In short, I was very dissatisfied with the way QJ.net handled the contest. If they honestly believe that the "Redneck Joke Generator" (a "game" where you push a button to get one of some number of pre-programmed jokes stolen from some website) is better than Dyox, I'm not really sure I want to know their judges. It's possible that I was disqualified for posting the game on NeoFlash before QJ.net announced the winners, but they sure didn't make it clear. The NeoFlash contest seemed a bit better, although it wasn't very well organised if you ask me. They had four judges look at the games and rank them by how much they enjoyed the games. There was also a poll on the forums where users could vote for their favorite game. The poll, however, stirred up some controversy as it seemed to generate more votes than there were downloads! The poll did factor into declaring the winners, so it may have been a bit stacked, but otherwise I feel the contest was pretty fair. Dyox ended up placing 6th in the contest out of 24 entries. Wrapping things up, I'm overall very proud of Dyox. I think it's a very complete and well made game, especially for having a two month time limit. You can grab the game and try for yourself at the Downloads Page. Enjoy!